A dark mist is smothering the city in the valley. Superstars live in fear. A monster haunts the forest, the locals are restless, and the biggest event of the year is threatened. This is the world of Scooby-Doo! WrestleMania Mystery. 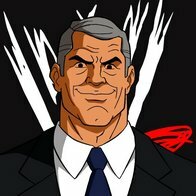 The combination of the real-life cartoon that is the WWE and a real-cartoon cartoon is an obvious one. When I first saw the trailer for this movie, ubiquitous on WWE programming of late, I was struck by the idea of something akin to John Cena’s Rock n’ Wrestling, an update of the 1980’s cartoon still recalled fondly by some. While this movie does give Sin Cara a convertible reminiscent of the Hulkmobile, it is obviously not what Scooby-Doo! WrestleMania Mystery is nor what it meant to be. It still offers some good gags in an animated adventure featuring the Mystery Machine crew storming into WrestleMania to prevent a ghost bear from stealing the WWE Championship. Oh indeed. There are also, of course, quite a few cartoon-style embellishments and simplifications. Many of these center on the conceit of WWE City, a company town wholly owned, operated, and policed by WWE, containing corporate offices, barracks used to house wrestlers (and the Mystery Inc. gang while they’re there), and the indoor arena that hosts both a house show toward the beginning of the movie and WrestleMania [number redacted] at its climax. On the mountainside, visible from all points of the city, is a gigantic carved reproduction of the WWE Championship, “a prize set in stone and the dream of every superstar.” All superstars seem to eat, sleep, and live in their ring gear at all times. Triple H is a generic good guy—in fact, ultimately, none of the wrestlers are presented as villains. This movie must also have had some considerable lead time in its production, as it features several people who aren’t being featured on television upon its release: Brodus Clay has a supporting role, The Miz has a small but significant (and actually funny!) role, and Sin Cara is basically presented as the number-two face behind only John Cena, who appears in a very Cena-like T-shirt that isn’t actually any of his dozens of past shirts. Kane has his mask. 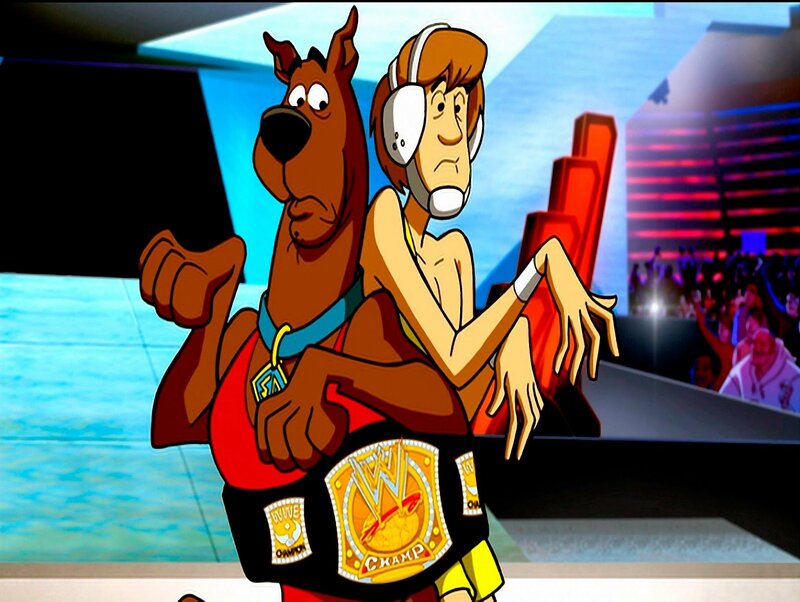 And for all the talk of theft and all the plot developments around Scooby & Shaggy being falsely accused of crimes, the Hounds of Justice are nowhere to be seen. This is neither good nor bad, merely something that stands out while watching. For all the talk about how stale the WWE roster has gotten (and it has in many ways), there’s still an undulating underbelly that’s revealed by a more protracted project like this. Also, notably, the WWE Championship that acts as the MacGuffin in the mystery plot is the old belt, the 2005-2013 design most closely associated with John Cena. The Scooby Gang has its impact even apart from Shaggy & Scooby. Daphne’s instant crush on John Cena provides some decent goofs, but Velma has a more interesting role thanks to her tendency to perform genre-savvy analysis from within the narrative, effectively doing my job as a critic for me. She observes that the character of Ruby, who is trying to become a superstar despite his uncle’s doubts, represents the heroic male aspiring to the stature of decorated warrior, and that his journey is relatable and therefore appealing to a wide audience, as if she still needs to sell the producers on his inclusion. Elsewhere in the movie, she briefly examines the relationship between ancient gladiatorial champions’ golden honorifics and the championship belt. Thanks, Velma! The movie finds ways not to drag, always having something happening, even during the mystery plot that could otherwise have been tedious. John Cena helps the Mystery Inc. gang investigate, and at one point has to explain electromagnetic pulses to them. Or maybe it’s not as strange as it seems: you see, the thing about EMPs is that they don’t affect the range of light visible to humans. You can’t see them. At any rate, it’s nice to see that he was able to fit in some science courses during his doctoral program in Thuganomics. Actually, there’s an easter egg in a Hall of Fame plaque listing the names of the movie’s director and other creators, next to which is a plaque reading “WWE University Honorary Doctorate in Body Slamming,” so perhaps we know where Cena went for his postsecondary education. It had better be an accredited institution, or that degree will be useless anywhere else. 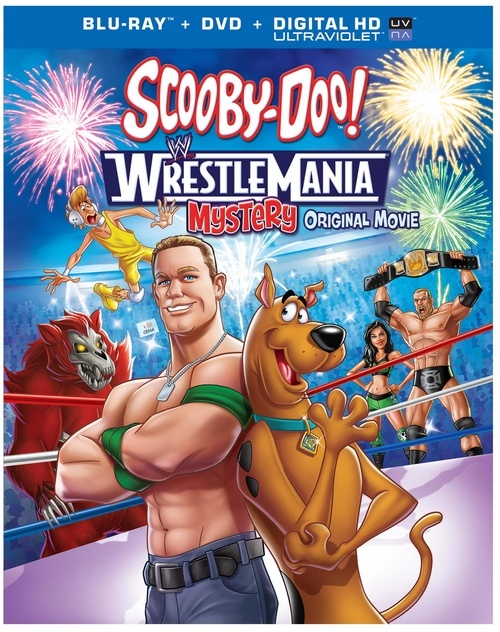 Overall, if you have a moderately well-developed appreciation of camp and a child who likes Scooby-Doo and wrestling, this movie should be a good fit for everyone. And if you have a very well-developed appreciation of camp, it should satisfy you on its own. Just make sure to stock up on Scooby Snacks first.